No football club in the Netherlands has such a close relationship with its fans as Feyenoord. Known as the Legion, Feyenoord’s supporters always get behind their team at De Kuip in good times or bad. They do so with so much passion that, clichés notwithstanding, they are a twelfth man for Feyenoord at home matches. In fact, the number 12 shirt will never be worn by a Feyenoord player, it has been exclusively assigned to the fans. They are the ones who drive Feyenoord on to achieve great things, with whom those achievements are celebrated. And they are also the ones who remain loyal to the team come what may. They are the heart that keeps the club alive. 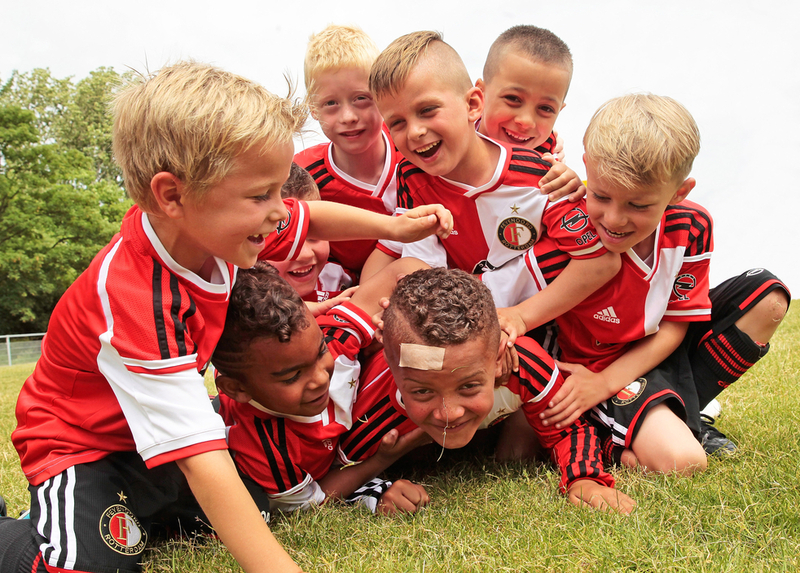 They are Feyenoord. De Kuip has been the place where the Legion comes together for years. A place where everyone is welcome and everyone can get to. 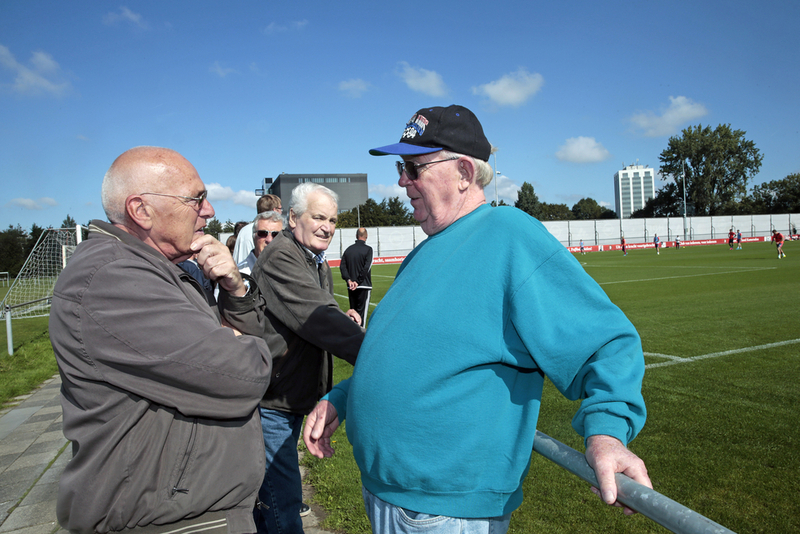 People from all over the country come to the stadium on match day to experience the climax of what they have been looking forward to the whole week: their club playing ninety minutes of football. Trains are packed with people in their Feyenoord colours long before they reach the city limits, while the motorways fill up with cars, coaches and motorbikes all heading for one destination: De Kuip. In the city itself, preparations for home matches begin well before kick-off. 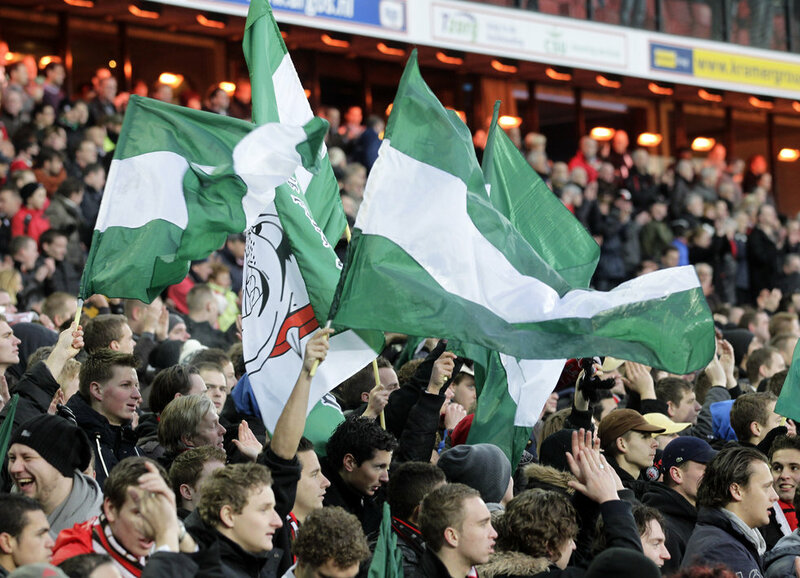 Feyenoord flags hang outside cafés and bars; friends and family meet with each other to make their match day plans. Neighbourhoods empty and trams fill up. On the way to the stadium people from all walks of life come together. From young to old, from labourers to professionals, people from diverse backgrounds, with diverse ethnicities. They all have one thing in common. Feyenoord belongs to all of them. Red and white blood flows through their veins, as it has, often, flowed through the veins of generations of their family. By the time they enter the stadium the tension is pushed up a notch or two. Until the kettledrums* announce the impending arrival of the players. The unique cover of the players’ tunnel rises and the teams emerge onto the pitch. Often the fans have arranged a special welcome in the form of a TIFO action. But first and foremost they show their appreciation vocally, and they continue to do so until the final whistle. It is unimaginable that opponents are not intimidated by the unprecedented atmosphere in the cauldron of noise that is De Kuip. There is nowhere Feyenoord supporters fear to tread. At away matches in the Netherlands the club can always count on the support of a full away section, which makes so much noise that the players feel like they are playing at home. But that uplifting support is also reproduced farther afield. The history of Feyenoord is littered with examples of European away ties that have attracted huge numbers of travelling fans. The first mass exodus was recorded long ago, 4 May 1963 to be precise. That day hundreds of thousands lined the banks of the Nieuwe Maas and the Nieuwe Waterweg to give the Groote Beer and the Waterman a rousing send-off. The two ships carried thousands of supporters to Lisbon, where Feyenoord took on the great Benfica in the second leg of the European Cup semi-final on 8 May 1963. Despite the huge support of all those fans Feyenoord lost the match 3-1. Seven years later there was another mass exodus, this time with a happier ending. Feyenoord met Celtic in the European Cup final. No fewer than 25,000 fans went out to Italy to see their club become the first Dutch side to win a European trophy. Many years later the Italian city again welcomed a huge contingent from Rotterdam South. Thirty-two years after the Europa Cup triumph, Dutch fans celebrated once more at the San Siro in 2002 as Feyenoord beat Internazionale in the first leg of the UEFA Cup semi-final. The visitors were backed all the way by eight thousand travelling fans, who started singing out their love for their club well ahead of kick-off. At the end of the match the Feyenoord players would say that the visiting fans were making so much noise when the team coach arrived that they had the feeling they were playing at home. Feyenoord fans have followed their club abroad more recently too. For the Europa League last-32 tie against AS Roma thousands of Feyenoord fans made the trip to the Italian capital. In Rome the Legion would get media attention from around the world, albeit unfortunately for all the wrong reasons. A tiny minority committed acts of vandalism in the city centre, seriously damaging the well-earned reputation of the vast majority of amiable, loyal supporters. Those fans who have continually shown that their love for the club known no bounds – literally and figuratively. 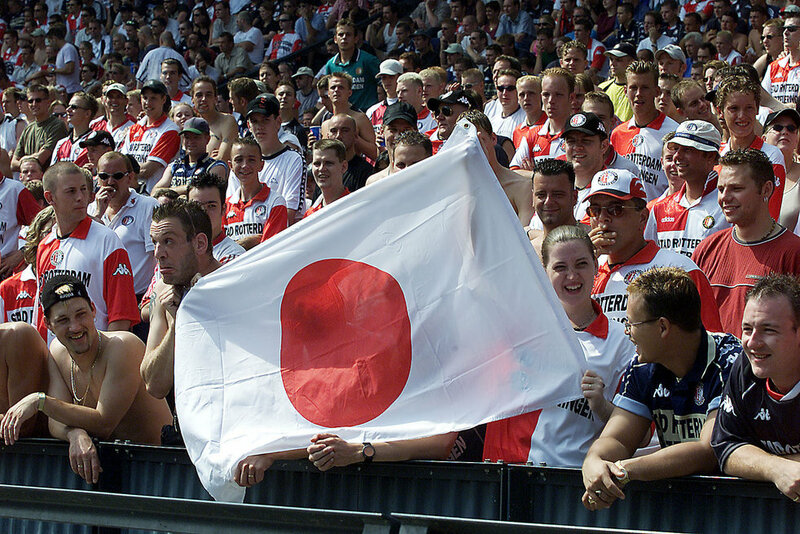 As well as the numerous supporters throughout the Netherlands who follow Feyenoord with such passion, the club also has thousands of fans abroad. So much so that every issue of the official Feyenoord Magazine features a full-page article on a different Feyenoord fan who does not live in the Netherlands. The members of that ‘Foreign Legion’ do everything they can to stay up to speed on developments at their favourite club. 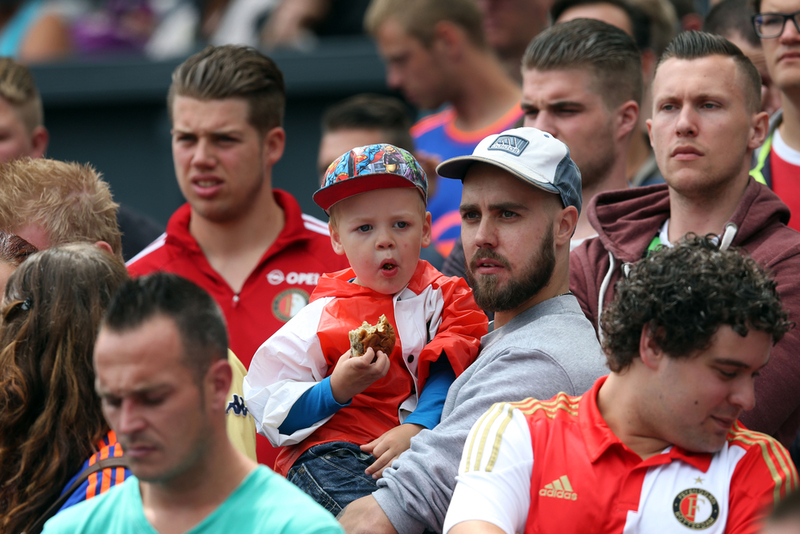 However far away they live, their priority is to see Feyenoord’s matches, whatever it takes. Even if that means setting your alarm for the dead of night because of the time difference. And it turns out that you don’t need to be Dutch to be a Feyenoord fan either. De Kuip, the atmosphere in the stands and the never-say-die attitude on the pitch hold a powerful attraction for football-loving foreign nationals. One Englishman even makes a point of crossing the Channel to attend every home match at De Kuip. This all makes Feyenoord the club that it is: unique, and loved in the remotest corners of the world.